and statesmen, whose names are forever inscribed in the history of Kazakhstan lived and worked. The history of Kyzylorda dates back to 1818, when the Kokand prince Omar built the Akmeshit fortress on the left bank of the Syrdarya. Located at the intersection of caravan routes from Tashkent, Bukhara and Khiva through Atbasar to Western Siberia, through Torgai to Troitsk and Orenburg, it was of great strategic importance. Three wells, two mosques and about fifty houses surrounded by fortress walls, about eleven meters high, looked like the fortress of Akmeshit, located in the area called Begaly Koga. A ditch filled with water was dug around. The fortress was surrounded on all sides by reed and shrub thickets, during the flood flooded waters of the Syrdarya. These natural obstacles were a reliable defense of the fortress. Kokand residents, who lived in the fortress, often raided the small Kazakh villages - they stole cattle and captured people. The Kokand residents established a tax for the local population: from each family - six rams, twenty four bags of coal and four carts of saxaul per year, which was an unbearable burden, especially for the poor. Kazakh batyrs, dissatisfied with the orders of the Kokand conquerors, fought with them. They describe the struggle of the Kazakh people with the Kokand conquerors led by batyrs. In 1853, the fortress of Akmeshit was taken by Russian troops. The arrival of them was welcomed by the local population with enthusiasm, as it saw a relief from the dominance of the Kokand people. About nearly three thousand people took part in the storming of the fortress, of which two thousand three hundred people were Russian army soldiers, five hundred were local people. The Russians had powerful artillery, whereas the Kokand people had only a few cannons, which they transferred from one side of the fortress wall to the other - this Perovskiy became known from scouts from the local population. For the capture of the fortress Perovsky was given a rescript, in which he was declared grateful and awarded a reward. In the spring of 1854, on the bank of the Syrdarya, General Perovsky began the construction of the fort, the adjacent territory in more than 80 thousand square meters. km was called Perovskiy district, where, in the main, Kazakhs lived - nearly two hundred thousand people. Perovsky district is located to the east of Kazalinsky district. The fortress of Akmeshit, renamed in eighteen sixty two in Fort Perovsk, became an important strategic point for the Russian Empire in Central Asia. A new stage has begun in the life of the region. In eighteen sixty seven, the Turkestan governor general was formed on the territory of the Kazakh steppes, which consisted of twenty three volosts, which included nearly two hundred villages. Perovsk began to be actively built up. It is noteworthy that the architecture of Perovsk was similar to Orenburg. During construction, the same building material was used. Let's us consider the history of the city thoroughly by providing a review on how it was founded. At the second session of the Kazakh Central Executive Committee in October 1925, there was a report provided on a brief history of the decision to move the capital. According to that, this idea emerged before, three years ago, when Akmeshit was still part of the Turkestan ASSR. This city was attracted by the fact that it stood on the main railway line, and was in an area populated mostly by Kazakhs. This was indeed the case, since in Kyzylorda district in 1925 there were twenty two thousand farms, of which only nearly five hundred farms were Russian. The authorities intended, in connection with the process of national-territorial registration of Kazakhstan, to create a truly Kazakh center. It was repeatedly brought up that the meaning of relocating the capital to Akmeshit is not in the convenience of housing in it, but in the desire to lay the actual Kyrgyz center. It was necessary to wait for the transfer of part of the provinces from the Turkestan Autonomous Soviet Republic to KazASSR, so that this idea was realized. After registration of this program, in February 1925 the process of transferring the capital started. Transferring the center of the Kazakh Autonomous Socialist Soviet Republic from the city of Orenburg to the provincial city of the Syrdarya region Akmeshit (Kyzylorda) was adopted by the decision of the Kyrgyz Central Executive Committee in February. In the resolution, it was found necessary to transfer the KazASSR center from Orenburg to Akmeshit, and the implementation of the decree was entrusted to the Council of People's Commissars. For examination and study of the city and for betraying the city's appearance, a special commission was created under the Council of People's Commissars. On February 23, 1925, a commission on the transfer of the capital arrived in Akmeshit, and first of all it was faced with the fact that they had to look for a room for work. After the commission was placed, its members began to inspect the houses needed to accommodate the institutions and their employees. Suitable buildings in the city were very few, and they were in neglect and required repairs. Meanwhile, fourty nine institutions and more than thousand employees had to be transported to the new capital. The commission had to hastily organize repairs to take at least the main institutions in the renovated buildings. With the apartments it was even more difficult, since the city's housing stock barely contained the available population and did not have a reserve to accommodate more than a thousand people. The commission's work was noted as they had to adapt to collapsing sheds, kitchens, baths for the institutions and apartments of employees. Even the eviction of a part of the residents from their houses was carried out to give houses for the apartments of employees of republican institutions. Fifteen hundreed residential buildings were a significant part of the city's development. But this was not enough. Already in September 1925 it was necessary to organize a construction commission and begin construction of fifty new buildings, including fifteen residential buildings, since the housing crisis did not recede. In August 1925 in the queue for the allocation of apartments still stood 200 people. Many institutions moved to Kyzylorda before the government to pre-establish the necessary work. So, in summer, the newspaper "Sovetskaya Step" moved from Orenburg to Kyzylorda, and the new issue was released only in July. However, the ceremonial relocation took place in mid-July, when a government train arrived in the early morning at the station of Kyzylorda. Arriving members of the government and employees faced enormous communal difficulties. Kyzylorda at that time did not have a city economy and the city's residents were hard-pressed to provide the most necessary public services. For example, in the city there was absolutely no electric lighting, and a small generator was only in the cinema. Lighting was provided with kerosene lamps. Prior to the government's arrival, the streets at night were completely dark, which forced in August 1925 to buy twenty two street lamps and four hundred house lamps to provide at least minimal street lighting. The first item of necessity was a kerosene lamp, and the newspaper described the difficulties that accompanied the purchase of lamps and kerosene. Employees were forced to carry bottles with them, and after work went to the Oil store for kerosene. There was no water supply in the city, and city irrigation ditches solved this problem, as well as a small water pump that supplied water from the Syrdarya, with two extremely worn-out engines that were constantly repaired. At the same time, the population of the city treated the irrigation ditches quite freely, which compelled the county city executive committee in September 1925 to introduce rules for the use of water. Urban irrigation ditches drained and dumped garbage, they could block irrigation ditches, could build clay and cement for construction work, and use water to make bricks that were immediately on the streets. In the end, funds were allocated to build a new and more powerful water pump. The biggest problem was the garbage on the streets, which the homeowners threw anywhere. The clogged streets were completely unrelated to the capital status of the city, and the authorities began to fight this phenomenon. Obviously, at first they tried to exhort and persuade, but it did not help much. This problem was solved by the introduction in August 1925 of quarterly stewards, who were charged with monitoring the cleanliness of streets and courtyards, and the sanitary condition of the quarters. Attaching an extremely high importance to the new construction in Kyzylorda, the Kazakh Council of People's Commissars organized a construction committee under the Council of People's Commissars. It included representatives from the Council of People's Commissars, the State Plan, the People's Commissariat of Finance, the Kazakh branch of the Central Council of Trade Unions, the Workers' Peasant Inspection, and the People's Commissariat of Internal Affairs and State Insurance. For the new construction of the city, a construction committee was established, and the regulation was approved later on. With the construction committee, a construction bureau was established to carry out all construction and repair work. The employees of the construction bureau were in the civil service, the salary for the maintenance of the apparatus is deducted from the total amount of the estimate of four percent. The head of the construction bureau accepted the proposal to head the bureau, the staff of the construction bureau consisted of twenty six people. As a part of the construction bureau, the chief engineer Tynyshpayev was also the deputy chairman of the construction committee for the technical part. Before his appointment as deputy chairman of the construction committee, Tynyshpayev worked in the organs of the People's Commissariat of Agriculture in the Turkestan Soviet Socialist Autonomous Republic, and after state-national disengagement in Central Asia he held the position of senior specialist in the land management of the nomadic population. The decision of a special commission of the Executive Committee was excluded from the list of employees of the nomadic economic commission, and was seconded to the Kazakh Central Executive Committee. M.Tynyshpayev put forward the idea of ​​creating a construction bureau at the construction committee of the Council of People's Commissars. It was said about the need to create a special state apparatus for new construction. So in the letter Tynyshpayev wrote that taking into account the fact that the construction work has recently been handicrafted and is proceeding at an extremely slow pace, in view of the lack of organization of the case and the lack of the necessary unity in the procurement of materials and the advisability of introducing new construction works to the floor and in the organization of the construction and technical committee and the construction bureau subordinate to it. In view of the importance and urgency of this issue, it was decided to send to Orenburg a report on this issue to the Council of People's Commissars of the head and member of the technical committee of the Council of People's Commissars for the development of the city of Akmeshit engineer. The construction bureau at the construction committee was a line device created under the building committee of the Council of People's Commissars. The construction bureau was entrusted with the production of construction works, not only for institutions that are on the state budget, but also for government agencies that are based on economic calculation. A general characteristic of the three modes of production can be seen in the following comparative analysis. Firstly, contractor is failure in terms, poor quality, high costing and rejection, use of advances not for their intended purpose, loss of about two months for bidding and other formalities that may entail the non-use of the loan in whole or in part short of the time until the closure of loans. And the advantageous side was the lack of administrative accounting records. Secondly, the economic way consisted in the complexity and cumbersome maintenance of the device in essence and reporting, the difficulty of quickly recruiting into the staff of practically experienced employees serving the apparatus. The advantageous side was the ability to immediately begin work on the opening of loans, without waiting for additional deployment of maintenance personnel. Finally, the semi-economic way is the availability of a ready-made staff of selected specialists, the opportunity to immediately begin work, the entire apparatus in Kyzylorda itself without making contributions to Moscow or other centers and minimizing administrative accounting reporting. At the meeting, a technical meeting of the Construction Committee discussed the savings by saving living space in houses for citizens and employees of state institutions.The chairman of the construction committee proposed to reduce the cost of residential houses and this could be achieved through common latrines, wells and sheds, for several nearby houses, as well as the construction of farm buildings by native methods without a foundation. In the exchange of opinions, it became clear that it was possible to determine the cost of household buildings for each house not exceeding fifteen hundred rubles and to reduce the cost of constructing houses, so that a huge amount of money were allowed to build one communal-type house, fourteen houses of fifty six apartments with a total of two hundreed rooms. The norms were approved for designing the building of educational institutions in Kyzylorda. Also at the technical meeting of engineers of the construction bureau, which was held by the end of August, the question of the types of houses for employees of state institutions was discussed. Six types of houses were adopted, in which the personnel of state institutions arriving in Kyzylorda were to be accommodated. Particular emphasis was placed on the types of buildings for state institutions and residential buildings for employees of the state apparatus. At one of the meetings of the construction committee, the question was raised, considering which type to stop, and several options were proposed, but preference was given to one-story buildings. Since high buildings in conditions of climatic peculiarities of the city of Kyzylorda were unsuitable. When surveying the city, it was revealed that at a depth of eighteen meters there were groundwaters, and if building two- or three-story buildings, then for heating it would be necessary to make a basement depth of right meters, and because of the groundwater the walls and the room itself would be damp. At the meeting of the technical council this issue was discussed in detail. It was said that they must not dwell on the question of what material they would build a house - from burnt or adobe bricks. It was necessary to decide which buildings are profitable - one-storey or two-storey in relation to the convenience of accommodation. I definitely stand on one-story buildings for both from a sanitary point of view and in the conditions of the eastern climate it is much more convenient to live and place in it. After all, American billionaires forced to climb to the sky lack of space, but at the same time, when they skip out of skyscrapers and go to their country houses on their own trains, they are placed there in one-story buildings. They are forced to climb to the sky lack of space, and in Kyzylorda for fifty and even hundred years of this can not be. All eastern cities have the character of wide buildings, it is their incentive, their style and I think that from the point of view of floors - one or two floors, it is more desirable than single-storey buildings. The construction planned to divide the city into two parts: a new and an old city. In the new part of the city it was planned to build buildings for state institutions and houses for employees of these institutions. When planning the city, the requirements of safety and sanitary hygiene, as well as the future of cultural and educational significance for the city's population, were taken into account. The new streets were broken parallel to each other, and the alleys crossing them perpendicular to the latter. This width of the streets was determined by the need for tree plantings in two rows on both sides of the streets, and also had to have dense roads wide enough for tram, horse and motor traffic. The streets of the city were not paved, and therefore in Kyzylorda everywhere and everywhere there was dust. The city simply drowned in the dust, which climbed into any corners, regardless of the cleaning. The city could not cope with this problem, since street paving required such means, which the republic did not have at its disposal. One solution was to water the streets, but there was no water for this. As a result, the problem began to be solved by the layout of the natural service. The owners of the houses had to build a paved sidewalk before it, and the owners of the tents on the market were forced to pave the market square. Akmeshit had several small baths, which were barely enough for the needs of the existing population of the city. After the move of the government, the relocation commission confiscated two baths and rebuilt them under the premises of the institutions. As a result, a bath crisis broke out in Kyzylorda in 1925, which manifested itself in the fact that the baths were constantly crowded, there were always queues in them, and tickets were sold two days in advance. To top it all off, it was not always possible to buy food in the city. It turned out that cars from flour did not arrive from Orenburg in time, and then there was no flour milling in Kyzylorda. The county city executive committee promised through the newspaper that within two or three days there would be a break in the bread. Another consideration was the question of covering the city as one of the most important aspects for the city. First of all it was suggested to highlight the most crowded streets, the streets planned for paving, it was necessary to distribute the lights so that the trees do not block the light, the distance between the lanterns is determined in such a way that the light from one falls to another. The chairman of the county executive committee K.Rustemov was instructed to proceed immediately to the preparatory work for the installation of gas-lanterns arriving in the city with the expectation that the main streets would be illuminated. At the beginning of the construction work, a total of nearly two million pieces of bricks were prepared, of which five thousand pieces of iron ore, an ample amount of white brick pieces, and over million red bricks. Brick of the third grade - burned, dark brown, used only on foundations. The cost of producing the bricks in stock was twenty seven rubles per thousand pieces. Bricks were manufactured economically at eight plants located within Kyzylorda belonging to the construction committee. Materials for construction that were harvested directly in the city, such as sand, alabaster, bricks and lime were in sufficient quantities, but materials that were brought from other regions such as wood, cement and glass were not enough. For example, there was absolutely no material for the installation of an insulating layer at the disposal of a construction bureau and it was not possible to get it in the shortest possible time possible to build a building (first and second stage schools, a dwelling house and a diesel warehouse) using cement. To be in time for the delivery of these buildings, the local method of isolation was used. This method consisted of using a lining of one or two rows of chii with pouring them with a lime mortar. Up until the end October, fourty two roundwood cars were received, and another letter was sent by telegraph to Tashkent, so they sent an additional twelve cars. A total of fifty four round timber cars for the new construction went into the construction committee, which amounted to one quarterpercent of the total need for new construction of the capital. Bricks for construction were harvested with the help of artels, in which the local population worked. These bricks were delivered with the help of camels, which were specially used for construction work. Tbuilding bricks and other materials were delivered with the help of camels. Since there was no engineering available in the construction committee and insufficient funds were allocated to buy trucks. Construction and procurement of necessary materials took place under difficult conditions, this was the first experience of building a new capital in Kazakhstan and the rush that took place in these conditions affected the building of residential buildings. The entire construction season was held in difficult conditions. First of all, there was a shortage of funds for new construction, as well as construction material. To save money, the government of Kazakhstan had to hasten the construction of a residential building in a hurry. In the technical meeting of the construction committee in 1925, an engineer pointed out that local authorities offered to reduce the cost of residential houses and this can be achieved through common latrines, wells, sheds and other extensions for several nearby houses, as well as the construction of farm buildings by native methods without a foundation. Construction work in the city ended. At the initial stage, buildings were constructed for state and Soviet institutions, schools and apartment houses for employees of the state apparatus. The solution of many problems in connection with the construction of new buildings was discussed at the Council of People's Commissars of KazASSR and at the Council of People's Commissars of the USSR. The significance of these works was on the scale not only of Kazakhstan, but of the entire union. The most difficult period during construction and repair was the first months of the construction season. Since there were problems with lack of funds for new construction, materials and labor. Repair and construction work was of great importance for national and state development. 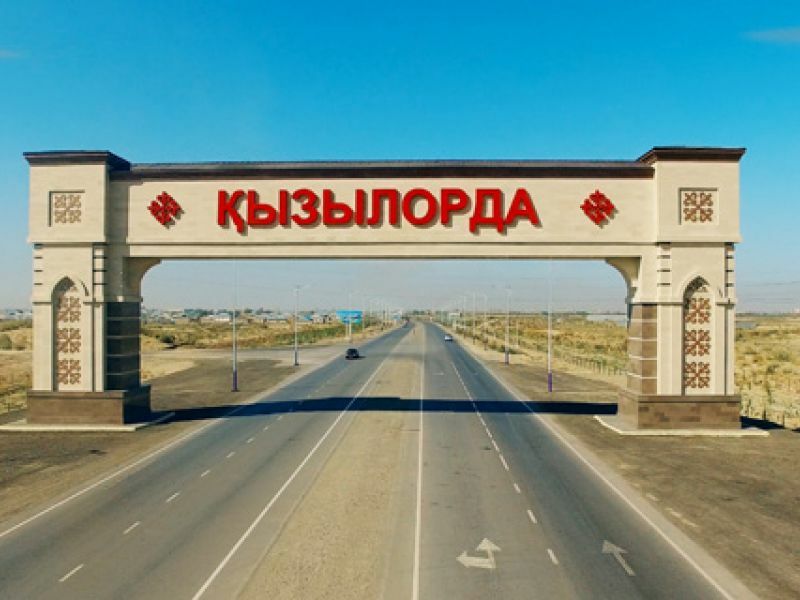 The relocation of the capital of Kazakh Autonomous Socialist Republic from the city of Orenburg to the provincial city of Akmeshit (Kyzylorda) was taken out of necessity. The city itself did not meet the demand for the capital, there was no established infrastructures and buildings for state institutions. To make the city look like the capital, it was decided to begin construction. If the construction equipment and the territorial extent of the former city of Perovsk met its administrative significance and living conditions as a county-level city, the relocation to it of the capital of Kazakhstan naturally required construction equipment and capacity of a different scale, more advanced and enlarged. The city of Kyzylorda, in terms of its territorial limitations, for the capital, first of all, was small, referring to the seat of the government in it, all central institutions and government bodies with their staff serving them. According to the survey of lands adjacent to the old city borders, the commission outlined the territory of the future new city, which is connected with the existing one and is its continuation, having shot instrumentally this territory on the plan, and having taken care of the manufacturing plan for the future city, with the expectation of its growth for 40 years ahead, and in the considerations of the proper architecture of the capital. The construction season of 1925 was to resolve the issue of the placement of employees and the institution. For the new construction, a construction committee and a construction bureau under the Council of People's Commissars of the Kazakh ASSR were established. All construction works were carried out by the construction bureau under SNK. During the construction season, the bureau started construction of a new building for public institutions and completed their erection by the end of 1925. In total, during the period from June to December 1925, 29 buildings were built, including residential buildings for civil servants.